I was born and raised in Rome, Italy, but now reside in Carlsbad, California. My painting happened by accident...in an interesting twist from sculpture and pottery, I discovered my passion for painting. 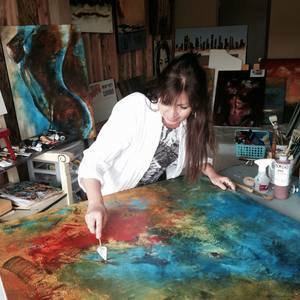 I am a self taught artist, and I enjoy exploring different avenues on my canvas, color and movement are my biggest attraction. My extensive travels and living in places like Africa, Alaska, England, France, among others, have helped me resonating images and dreams I apply on my canvas. For me painting is a form of self expression that goes beyond what you apply and see on the canvas... it is what you do not see by the naked eye but are able to see and feel by the soul...my spirit talks to me and expresses who I really am. Everything around me is a form of inspiration...an early morning dew, the smell of salty water, a word said with emotion, a tear, a smile, fire...nature, people, a poem...all is for me abundance of spirit and creativity, I see it all as a canvas to be filled. It is a continuous learning experience directed to feeling and bringing emotions from deep within, the goal is of never arriving at the destination, but continuing the journey of self discovery. Painting is a wonderful avenue for the curiosity of life...with all its amazing colors and beauty! When looking at my paintings, I want the observer not to think, to analyze, to figure out what it all means...I want them to just FEEL... Any emotion coming up from my painting is the right emotion...just feel it, and hopefully, they will be emotions of joy.